HOUSTON, TX (March 27, 2019) — “Dracarys!” Emilia Clarke, best known for her legendary role as Daenerys Targaryen the Mother of Dragons in HBO’s ‘Game of Thrones,’ is headlining Houston’s Comicpalooza Saturday, May 11 and Sunday, May 12 at the George R. Brown Convention Center. This year fans of HBO’s cultural phenomenon will have an opportunity to meet Clarke alongside Nathalie Emmanuel who portrays her trusted advisor Missandei in the award-wining hit series. “Game of Thrones is an iconic story in pop culture history, with a broad spectrum of remarkable characters and devoted fans,” said Michael Heckman, Comicpalooza President, “Emilia’s role as Daenerys Targaryen is central to the story’s final chapter. 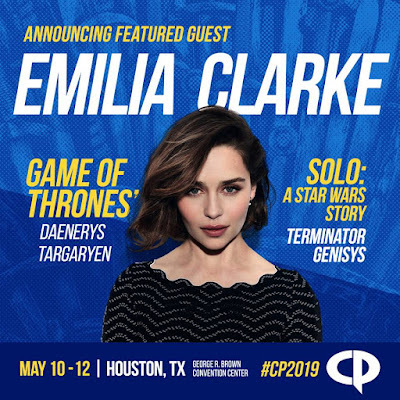 With excitement building as the season unfolds, it is the perfect time to bring Emilia and Nathalie to Comicpalooza.” This is the first time Clarke has appeared at a comic convention where fans can see her in a panel, take photos, and receive autographs. Clarke will soon be seen in the eighth and final season of ‘Game of Thrones,’ which will premier Sunday, April 14. The hit TV show is based on the bestselling novels by George R. R. Martin and has resulted in three Emmy nominations for Clarke’s portrayal as Khaleesi. Clarke and Emmanuel will be joining recently announced guests John Barrowman from ‘Arrow’ and ‘Doctor Who’; Erick Avari widely seen in film and television including The Mummy, Independence Day, and Stargate; Billy Zane from The Phantom and Titanic; along with cast members from Amazon’s ‘The Tick’ including Peter Serafinowicz and Griffin Newman, as well as, Gates McFadden and Michael Dorn from ‘Star Trek: The Next Generation’ TV series and movie franchise. Joining the on-screen talent is an impressive comic book lineup featuring Neal Adams, Chris Claremont, Gerry Conway, and Dan Jurgens. Additional celebrity announcements are planned over the weeks leading up to the show. For the most-up-to-date information, including a complete lineup of special guests, admission prices and schedules, visit www.comicpalooza.com. Comicpalooza is a unique, multi-format pop culture event happening May 10-12, 2019 featuring more than 1,000 hours of diverse, interactive programming that spans across Comic Books, Gaming, Films, Anime, Cosplay, Literature, Maker’s Space, Education, Children’s Programming and Entertainment.